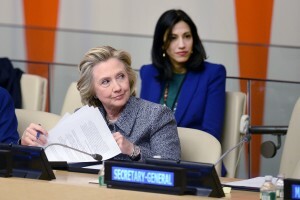 In May 2013, the New York Times reported that Abedin never disclosed her earnings and the private consulting that she was conducting outside of the State Department while continuing to serve as Clinton’s top adviser. Abedin worked for Teneo, which was founded by Doug Band, a former adviser to President Bill Clinton. The corporate client list for Teneo has included Coca-Cola and MF Global, the since-folded brokerage firm run by Jon S. Corzine. While consulting for Teneo and serving as Clinton’s top adviser, Abedin served as a consultant for the Clinton Foundation. During Clinton’s transition from senator to Secretary of State, Abedin worked as her personal assistant. Both Clinton and Abedin used a private email server and personal email addresses to communicate and conduct official business. Sen. Charles Grassley (R., Iowa) also raised a potential conflict of interest that both Clinton and Abedin had used a private email server. Linick said he was unaware that they were doing this and referred to a 2012 report that instructed an embassy to stop using commercial emails. Clinton also designated Abedin as Special Government Employees (SGE) program. "The OIG intends to examine the department’s SGE program to determine if it confirms to applicable legal and policy requirements," Linick said in response to a request from Grassley. Under the SGE program Abedin would be able to collect a government salary while also continuing to work for Teneo. Senator Grassley raised the question that in Abedin’s case she was already working for Clinton when she was converted to a SGE. The privilege of SGE is to be used entice someone in the private sector to split their time and for the government to tap someone with "special knowledge and skills. Grassley wrote to Secretary of State John Kerry that it is unclear what special knowledge or skills that Abedin possessed that could not have been obtained from a regular government employee.